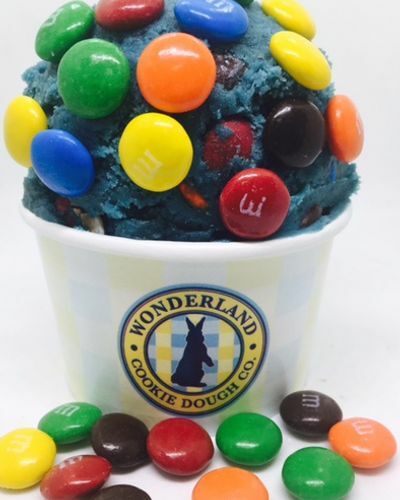 Fall down the rabbit hole of dessert HEAVEN at Wonderland Cookie Dough Co., the brand-new edible cookie dough eatery based in Celebration, FL. Our dough is egg free and 100% safe to eat straight from the bowl (the best way to eat it, of course). 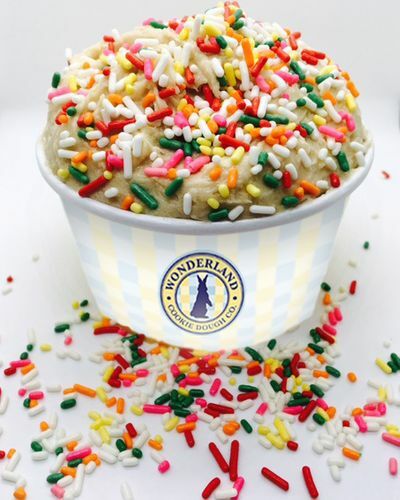 Each batch is made fresh daily with no added preservatives, using top quality ingredients. 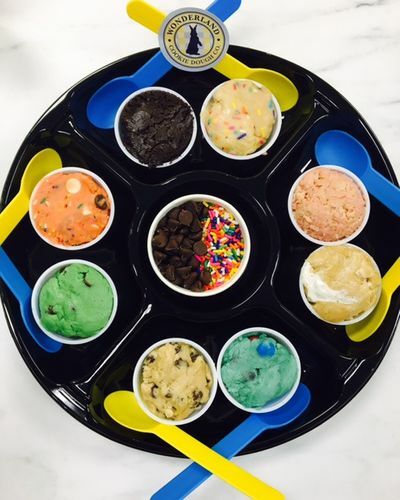 Come on in and grab a spoonful! How is your unbaked dough edible and safe to eat? 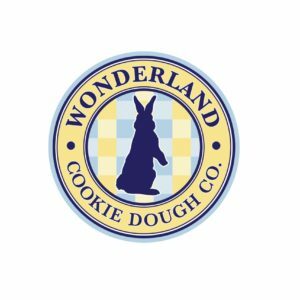 Our cookie dough is egg free and made with specially heat-treated flour; this eliminates ALL possibility of salmonella and other foodborne illnesses related to raw, untreated flour. Because of this, our dough can be enjoyed in its natural (and most delicious) state – straight from the bowl with no baking required! 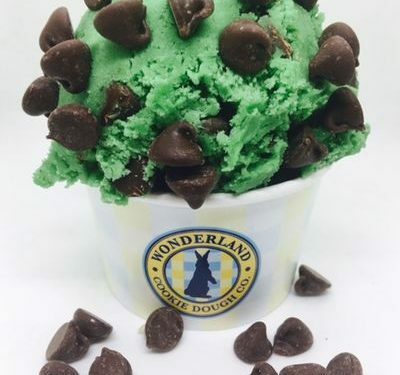 It’s made fresh daily and has the same smooth, creamy texture you crave with NONE of the worry. Do you maintain a storefront location? Yes. 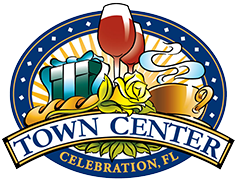 Our brand new store is located at 606 Market St. in the heart of downtown Celebration, FL. It’s a 10 minute drive from the Disney parks and hotels – make a quick trip over and see us during your next magical getaway! What are your hours of operation? Monday through Sunday 10 am to 10 pm. Do you take reservations? We do not accept reservations as we do not maintain a sit-down establishment. 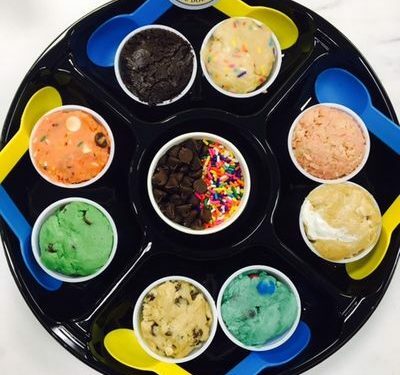 Our eatery is designed to let you walk through and order your dough to go! Do you sell your product online? At this time, all product is made and sold strictly in-store. 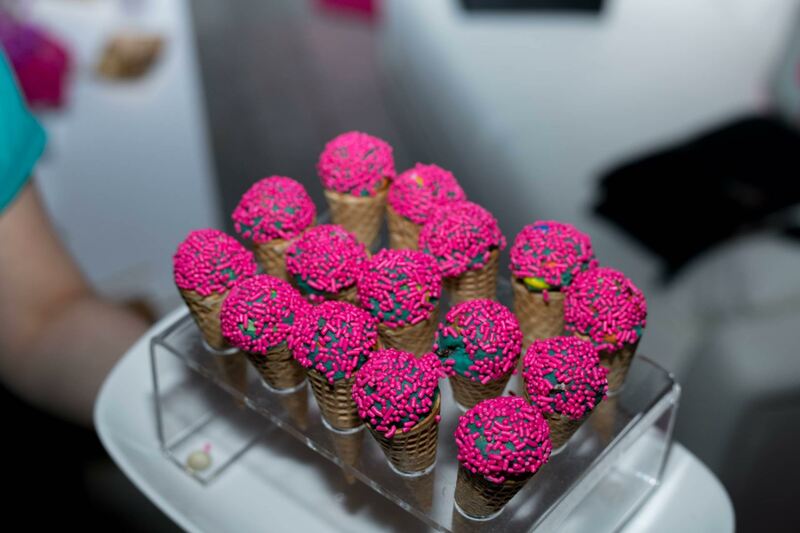 Do you cater private events? Yes! 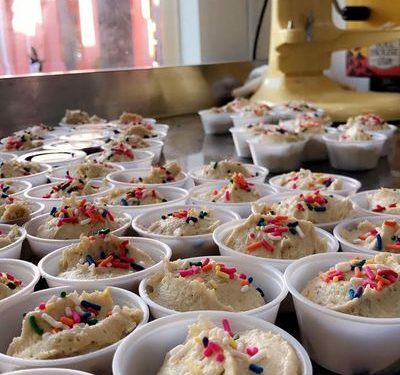 We would love to bring our dough to your door. Please note that there is a $100 minimum for catering services. Please contact us for more information. How do I store it and how long will it keep? 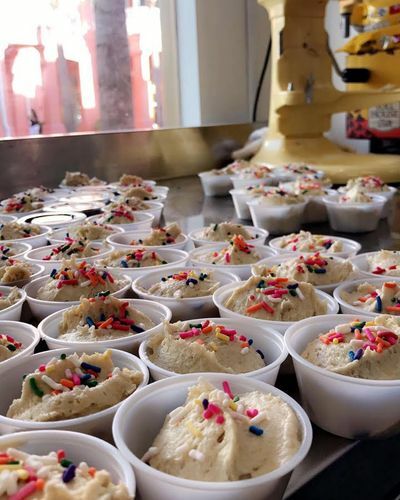 Our cookie dough can remain unrefrigerated for about 4-5 hours, will stay fresh if refrigerated for up to 10 days, and should be kept frozen no longer than 3 months. 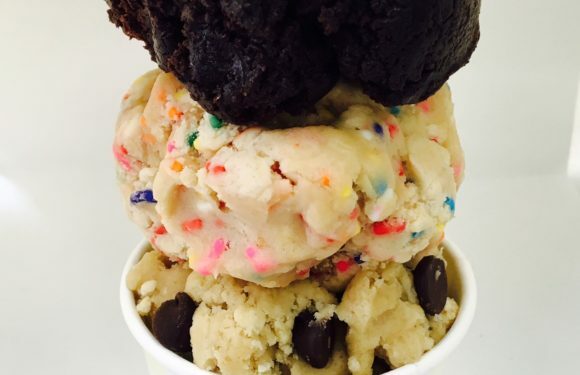 Do you serve any other products in-store beyond single servings of cookie dough? We are hoping to expand our options as quickly as possible. As of store opening, we will offer a small selection of other items for your enjoyment! Are there options for a variety of dietary needs? We will have a gluten conscious, vegan, and sugar free option. Some flavors do include nuts and nut byproducts. 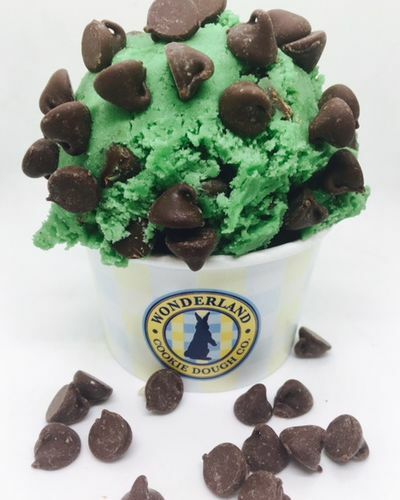 If you have an allergy, we will be happy to help you select a safe and delicious alternative flavor to try. 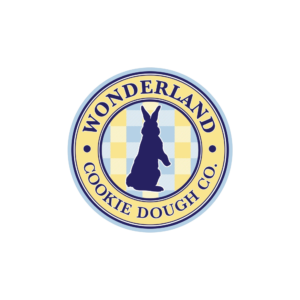 Those with severe gluten or nut allergies, please be aware that all of our dough is made on-site and may be subject to cross-contamination. 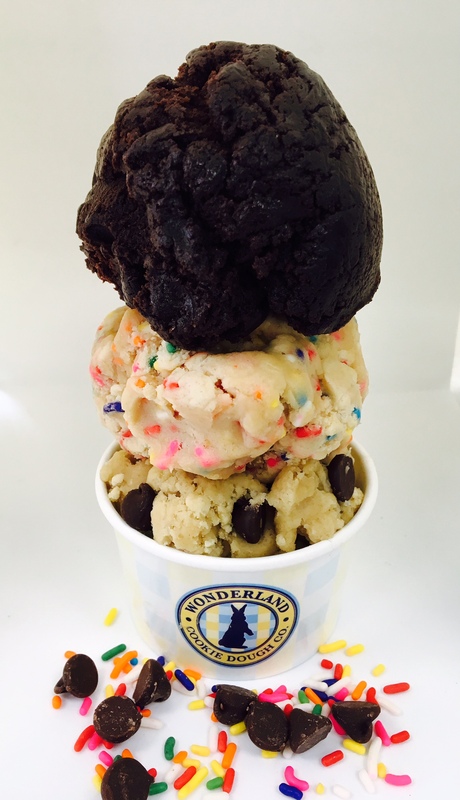 We cannot guarantee that any cookie dough offering is 100% gluten or nut product free. Do you offer Gift Cards? Yes we do! Pick one up today! 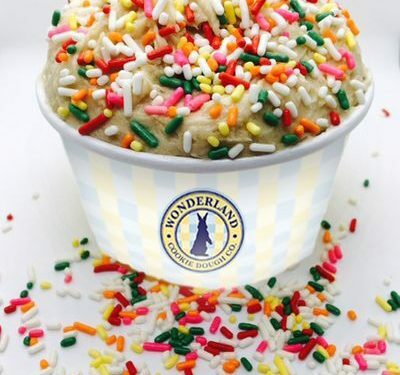 With all other questions, please email us at info@wonderlandcookiedough.com.